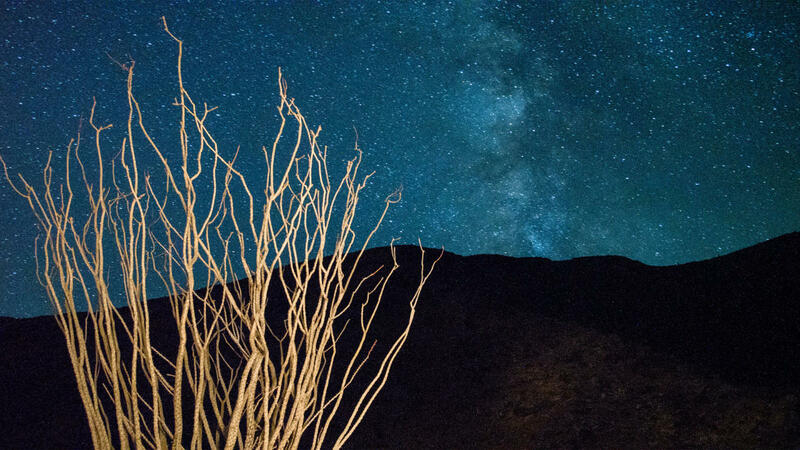 Sleeping under the stars can be a magical experience, especially in Greater Palm Springs. There’s nothing quite like looking up at a starry sky with a warm desert wind blowing over you as you fall asleep to the sounds of the natural world. When it’s time to escape the city, there are countless options for camping in and around Greater Palm Springs. From the popular Joshua Tree area to beautiful Anza-Borrego State Park, there are a multitude of possibilities. Before you pack up the tent and hit the outdoors, plan ahead for your water and power needs. Some campsites offer water but many don’t, so be sure to bring plenty of your own. If you need power or hookups for RVs, you’ll want to check with the campgrounds directly to see what’s available. In Greater Palm Springs, part of the fun is that you can find both fully serviced sites or more off-the-grid experiences. There are plenty of places to lay your head in the oasis. Your choices will come down to what you require in terms of services and how far you want to travel. 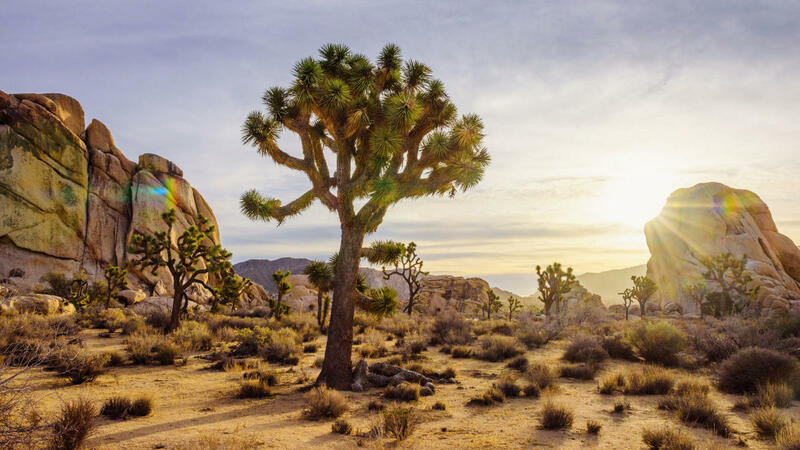 Some of the most popular and beautiful areas are Joshua Tree National Park, Lake Cahuilla, and Anza-Borrego State Park. Black Rock: Black Rock features 100 campsites in the northwest corner of the park. The Hi-View Nature Trail is easily accessible from the campsites and has the best views of the Yucca Valley, which are even better at night. Reservations can be made for Black Rock up to six months in advance. Jumbo Rocks: Jumbo Rocks campground features 124 campsites and, like the name implies, enormous rocks at close to 4,000-foot elevation. This campsite is very kid-friendly, so families, you may want to spend the night here. Hidden Valley: Hidden Valley is possibly the most visited campsite in Joshua Tree, so be sure to arrive early to snag a spot. Clamber over the massive rocks that ring the campground for some fun and exercise. White Tank: With just 15 campsites, White Tank is one of the smallest sites in the park. A huge granite arch, Arch Rock, can be accessed from the site and the area is usually quiet compared to other sites. It’s a first-come, first-served campground. Ryan: If you love sunsets, the Ryan campsite is for you. With 31 sites at an elevation of 4,300 feet, you’re all but guaranteed an incredible sunrise or sunset. Belle: Looking to really get away from it all? The compact Belle campsite is relatively quiet with only 18 campsites. Indian Cove: If being on your own in the desert isn’t for you, you’ll enjoy Indian Cove. With 101 campsites, beautiful rock formations and the unique Mojave yuccas, it’s known for its lively feel and beautiful vistas. This is another Joshua Tree National Park campground where you&apos;re able to make reservations up to six months in advance. Sheep Pass: Sheep Pass is a great option for larger groups. It has six campsites, and each site holds between 10 and 60 people. The Ryan Mountain trails are nearby, as well. Cottonwood: The Cottonwood campsite is at a lower elevation than the rest of the campsites; therefore, it can be a bit warmer than the others. The Cottonwood Springs Oasis is gorgeous and it gives a lusher view of the desert area. The Lake Cahuilla Recreation Area is another beautiful camping spot in Greater Palm Springs. This 710-acre park offers visitors green space and mountain views, making it a spectacular day or overnight destination. Located at the base of the Santa Rosa Mountains, Lake Cahuilla’s campground features 91 campsites. There’s also fishing, horseback riding, hiking, and barbecue areas. Lake Cahuilla campground also offers a Wi-Fi station for those who need to maintain some semblance of connection to life back at home. You’ll need to reserve a spot here: 1-800-234-PARK (7275). Anza-Borrego State Park is the largest state park in California. About an hour’s drive from Palm Springs, Anza-Borrego offers four developed campgrounds with 175 campsites. There are also eight free primitive campgrounds. Various areas of the park offer Wi-Fi access and there is a visitor center where you can get information and maps. Borrego Palm Canyon Campground: There are about 120 sites are here, spread out over three distinct areas. The park is named after for the Spanish term for bighorn sheep: borrego. Camping is available year-round here and some sites even offer full hookups. Tamarisk Grove: This small loop, 27-site campground offers perks like drinking water and day use facilities. Reserve a spot in advance and pick your site on arrival. Vern Whittaker Horse Camp: Vern Whitaker Horse Camp is what’s known as a developed equestrian campground. The site has 10 RV and tent spots, plus bathrooms with showers, drinking water, and, naturally, horse corrals. The campground is open year-round. Now that you have your campground picked out, find more ways to explore! Check out more on outdoor adventure in Greater Palm Springs.